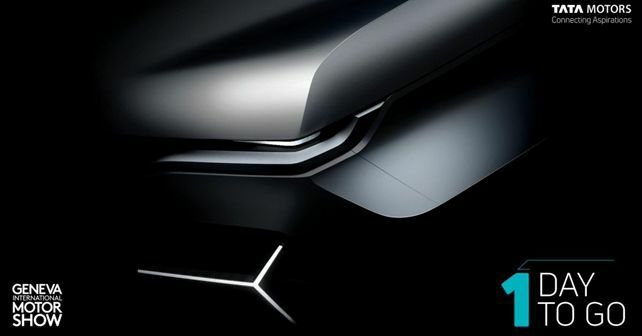 With Tata Motors set to reveal a slew of new products at the 2019 Geneva International Motor Show, the company has released yet another teaser which could be the first glimpse of the Hornbill Concept. After revealing the name of its upcoming premium hatchback, Tata has now dropped another teaser from its 2019 Geneva Motor Show product line-up which could well be the first glimpse of the Hornbill Concept. If rumours are to be believed, Tata will present the Hornbill as a 'micro-SUV', which will slot just below the Nexon compact SUV. While the teaser does give out some styling and design cues, very little has been revealed in terms of the car's overall specs. The first detail which piques the onlooker's interest is the tri-arrow pattern on the front fascia, reminiscent of the styling of the H5X Concept. However, as the Hornbill's design will also be based on the Impact 2.0 Design philosophy, this does not come as much of a surprise. Further, the sharp L-shaped LED headlight and an overall squared-off front quarter do suggest a boxy stance (something which is yet to be seen on Tata's new models). In terms of chassis, speculation does suggest that the Hornbill will be built on the company's new ALFA modular platform, which will also underpin the upcoming Altroz hatchback. Engine-wise, we think the existing motors from the Revotron and Revotorq line-up will power the Hornbill, although in re-tuned states. After the Concept's global debut at the 2019 Geneva Motor Show, expect the production-ready Hornbill to make its debut sometime next year.